This set is available as an accessory for the Pi Wall. 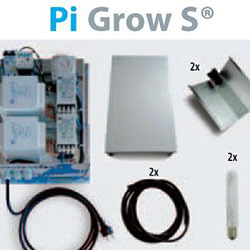 The grow light set allows growers to install their electrical equipment in their growing rooms themselves, without having to involve third parties. This comprehensive set comes with a CE certificate and an instruction manual. All prewired and mounted in a control panel. All the grower needs to do is connect the lamp cables to the ballasts and the reflectors.